Tuesday was the deadline for companies to propose designs for President Donald Trump's border wall with Mexico. 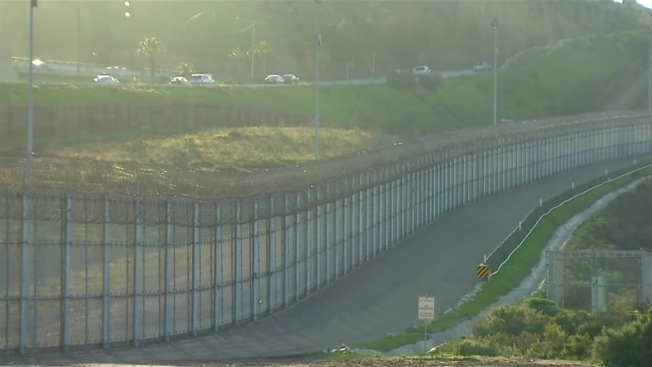 U.S. Customs and Border Protection will ask several of the bidders to build prototypes in San Diego. The government won't identify companies until contracts are awarded around June 1 — and even then, only the winners — but some bidders released plans on their own. Gleason Partners LLC of Las Vegas proposes solar panels to cover sections of the wall. The panels would provide electricity for lighting, sensors and patrol stations along the wall. Sales of electricity to utilities could cover the cost of construction in 20 years or less, according to the company. Power could also be sold to Mexico. A California company is proposing a border wall design they say would be aesthetically pleasing for both sides. NBC 7's Katia Lopez-Hodoyan has more. "I like the wall to be able to pay for itself," said managing partner Thomas Gleason. Crisis Resolution Security Services Inc. of Clarence, Illinois, proposes a wall that is 56 feet (17 meters) high and 22 feet (7 meters) wide at the top — with plenty of room to allow tourists to enjoy desert views. The height — nearly twice what the government envisions — would deter climbers, and its width would give the structure longevity, said chief executive officer Michael Hari. Clayton Industries Inc. of Pittsburgh proposes storing nuclear waste along the wall in trenches that are at least 100 feet (30 meters) deep. Money already collected by the U.S. Department of Energy from people who benefit from nuclear power would help pay for the wall. 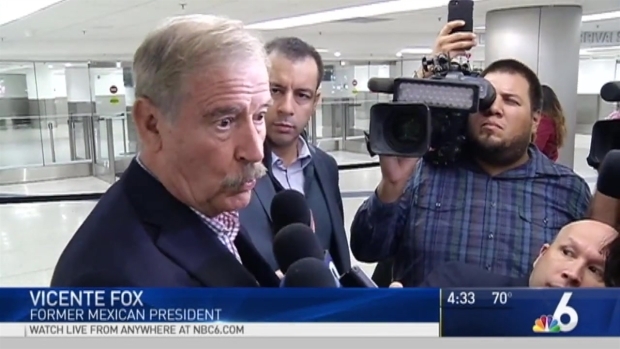 Former Mexican president Vicente Fox was in Miami Wednesday, where he reiterated his colorful stance against President Donald Trump and the proposed border wall. Concrete Contractors Interstate of San Diego proposed a polished concrete wall augmented with stones and artifacts specific to areas on the 2,000-mile (3,218-kilometer) border. Russ Baumgartner, CEO of the company, says the wall should be "a piece of art." Customs and Border Protection's solicitation says the wall should be "aesthetically pleasing" from the U.S. side. Baumgartner wants to decorate both sides. "You could fire a tank round at it and it will take the impact," said company founder Dennis O'Leary. Fiber sensors would be embedded in the concrete to immediately alert officials to any attempts to climb over or tunnel under the wall. It would be coated with a slick coating that would prevent climbing. 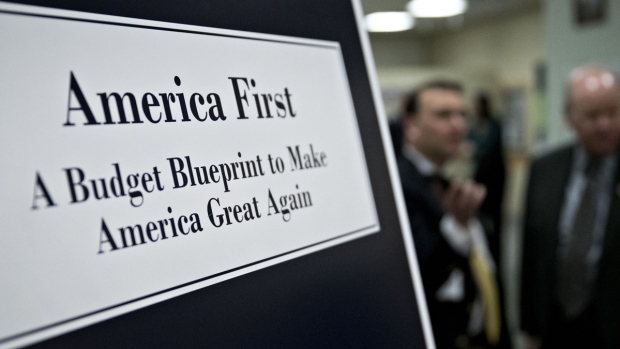 President Donald Trump's proposed budget includes billions of dollars for some of his most controversial campaign promises, including a $2.6 billion down payment on a border wall that he had insisted Mexico would pay for. Otra Nation, a group of U.S. and Mexican citizens, proposed the world's first shared co-nation along the border "open to citizens of both countries and co-maintained by Mexico and the United States of America." It would also create "nodes of cultural production" such as libraries, museums, galleries and workshops between San Diego and Tijuana, Mexico, and other spots with cities on both sides of the border. It would prohibit oil drilling and mining and create a "hyperloop transportation system" for people and cargo.